A KraussMaffei RimStar Compact 8/4 high pressure Resin Transfer Molding (RTM) mixing and metering system is recently installed in polymer specialist Rehau Group’s new technical center for lightweight construction in Viectach, Germany. Rehau is using the process at its Viechtach location to research new methods for developing thick-walled hollow components in lightweight design, such as hydrogen pressure tanks for vehicles. The goal is to achieve process control capable of supporting large-scale series production for these kinds of components. 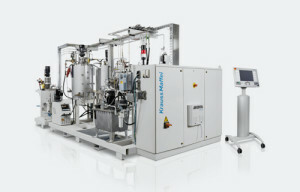 The collaboration with KraussMaffei began back in the prototype development phase. Initial component tests regarding the mold concept and high pressure resin transfer molding technology in the technical center for lightweight construction took place at KraussMaffei’s facilities. The results formed the basis for the design of the high pressure RTM system for Rehau’s new technical center for lightweight construction. Rehau’s RimStar-Compact 8/4 HP-RTM is equipped with a MJH 10P-2KVHM mixing head, optimizing the premixing of resin and hardener and works according to the self-cleaning principle. The mixing head system is round off with a release-agent metering, including the corresponding release agent station. 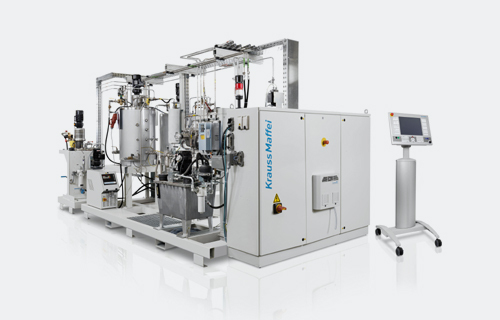 “High-pressure injection using the RimStar series enables the processing of fast-reacting resin systems. This makes it possible to quickly fill the mold for fiber reinforced components to the benefit of shorter cycle times,” explained Steffen Bauer, the Sales Manager for Reaction Process Machinery in Germany at KraussMaffei. The technology developed in-house at Rehau for manufacturing hydrogen tanks is to transition from the laboratory to production scale at its Viechtach production location. To accomplish this goal, the company invested €3.4 million in special systems engineering within the plant. This decision is a significant step towards the future for us – to drive the development of new technologies and to make an important contribution to maintaining job security at the plant location,” said Martin Wippermann, Member of the Executive Board for Rehau Automotive. Will European PE market sustain firmness following flat ethylene?